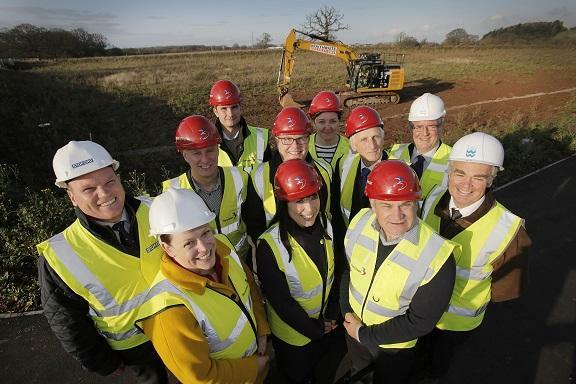 Work has begun on a £20 million environmentally friendly development that will bring a leading UK kitchen and bathroom manufacturer to Worcestershire. Kohler Mira, parent company of Mira Showers, is the fourth occupier to announce its move to Worcester Six in the last few months and marks a significant investment for the company, which is expanding its UK operations. Kohler Mira already has sites in Gloucester, Cheltenham and Hull, and has selected Worcester Six for the latest phase of its UK growth. Stoford Developments has appointed Bennimans, a Worcestershire-based contractor to construct the distribution, training and office unit site for the manufacturer. The developer expects to hand over the first phase, 158,000 sq ft unit by September (2019). A further 100,000 sq ft of space could be constructed at a later date. Key to the sustainable development is the inclusion of a large PV solar array on the roof, which should generate up to 1MW and will help towards Kohler Mira’s aims to be carbon neutral by 2035. Wayne Walker, Vice President of Manufacturing – Global Faucets at Kohler Co., said: “This purpose-built facility reflects both our continued investment in the UK and our commitment to sustainability and the environment. Worcestershire County Council Cabinet Member with Responsibility for Economy and Infrastructure, Councillor Dr Ken Pollock, said: "Work starting on the Kohler Mira site at Worcester Six marks another step forward for this fantastically located Business Park. With Kimal, Siemens and Spire Healthcare already successfully established on site, we hope news of Kohler Mira's state-of-the-art facility will help to attract further inward investment for the county of Worcestershire."